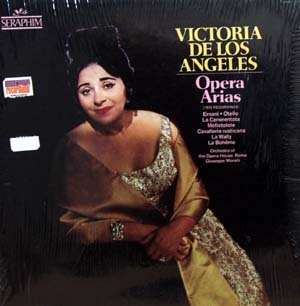 1955 Victoria De Los Angeles Opera Arias, Seraphim-60326. The record includes the following selections: Verdi: Ernani "Sorta e la notte'; 'Ernani! Ernani, involami', and other selections from Verdi, Rossini, Boito, Mascagni and Puccini. Cover still in shrink and Vinyl near mint. Satisfaction Guaranteed!